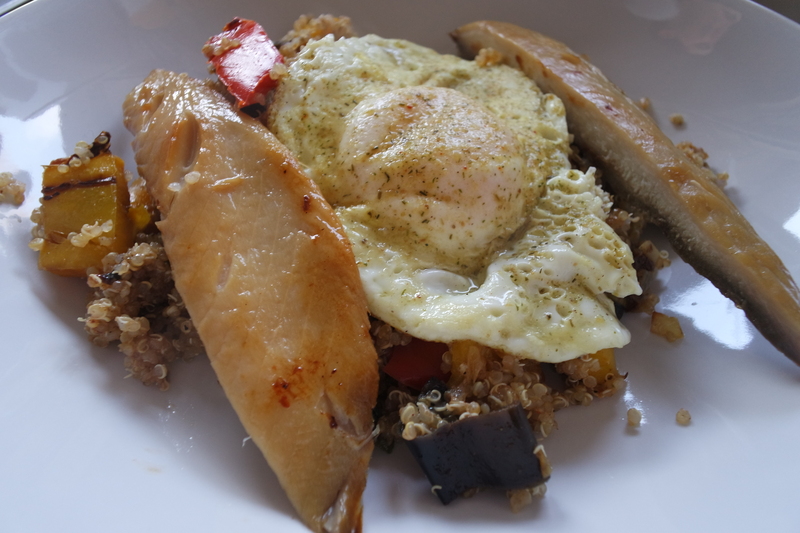 I think we can all agree that kedgeree is yumm. Best way to spruce up brown rice in my opinion. I like to make it with Mediterranean vegetables, and what goes amazingly with Mediterranean vegetables? Quinoa! Since I replaced rice with quinoa I have not looked back. Trust me and try it out! First things first, rinse your quinoa (to get rid of that bitter taste) and put it on to boil – the length of time it takes will depend on the type you are using, so check the packet. When it’s on, get to work on your vegetables. I like to grill my veggies in my George Forman grill as I think it gives them a better flavour, but they can easily be done in a pan. Slice/chop as you prefer, and get them cooking. Chop your onion and garlic and fry them up in a pan (if you’re pan frying your veggies you might want to combine these steps), then add your vegetables, salt, 1 tablespoon of cinnamon and 1 tablespoon of cumin. I sometimes use half a tablespoon of curry too – I haven’t been lately, as I have a stomach ulcer, and curry and stomach ulcers don’t really deal well together. Apologies for all the veggie pictures, they’re just so preedy! Once your quinoa is all boiled up nicely add that to the pan as well and simmer for a few minutes. It should smell amazing. The best herby salt I have ever come across (so much so that I get my mum to ship it to me from Italy) ‘Sale aromatic alle 7 erbe’. 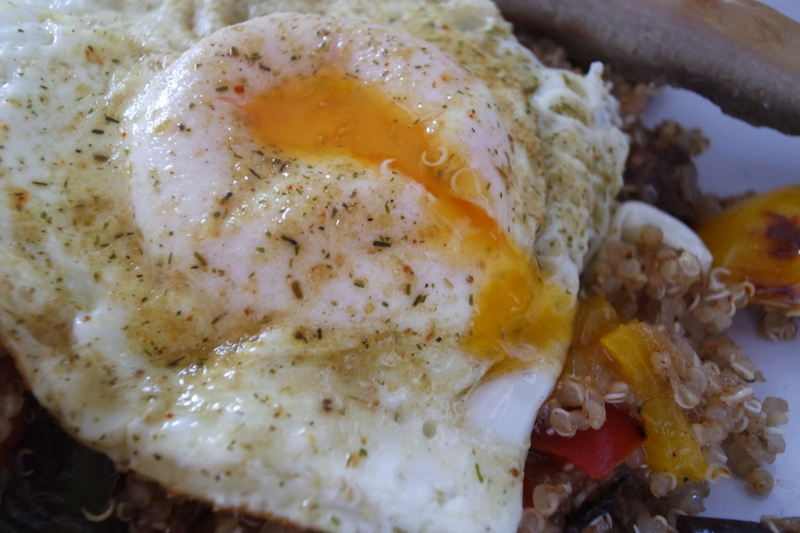 I put it in most things to be honest, but it gives fried eggs in particular an extra yummy oomph . I fry the eggs on a super high heat for a few seconds, then add a little water to the pan, cover it and turn down the heat for a couple of minutes. And voila! Your fried egg experience will never be the same again. 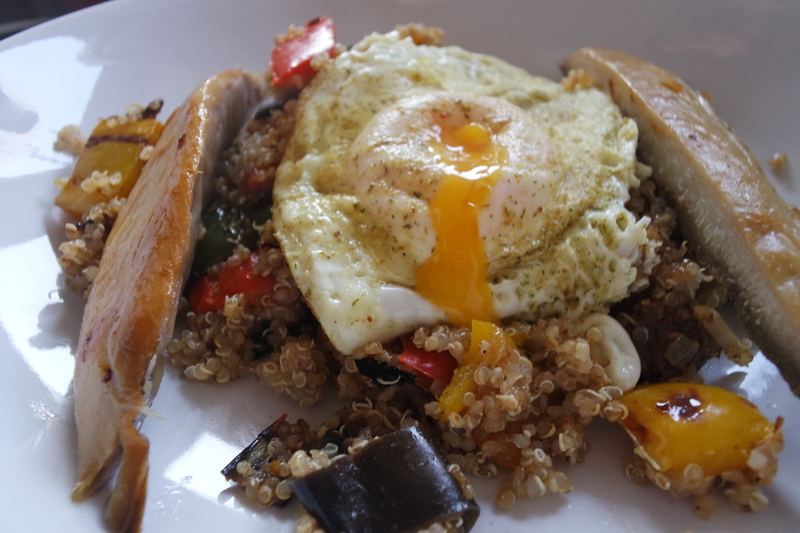 Arrange your quinoa and vegetables, egg and mackerel prettily on a plate, cut into the gooey yolk so it dribbles attractively into the quinoa, instagram and enjoy!